We start with Sensual Aspen in brown by Sensual Casonova. It’s got a lot of texturing including a prim pocket on the leg. I’m also wearing ~Aries Celestial Designs~ Enchanted jewelry, which is color-change but I liked the medley of color against the black and brown. My shoes are an adorable new design from Popfuzz called Silver Sparkle Stilettos. Finally, Sin Skins has put out holiday skins in all tones of the Ton Visage line for 500L. I’ve been putting this off for a while now because it’s a big job but the debut of the new Sin Skins Ton Visage faces finally spurred me on. The demo packs come with two skin tones, I’ve worn the lighter one, There are four makeup options: Daywear (full-length shot), Fresh (top square), Glam (middle square), and Runway (bottom square). Aisha is one of the new faces and my personal favorite. I absolutely adore the subtle sheen on the lips and the dramatic eyeliner. While I love the sheen on Aisha, I love the colors on Audrie. The lipstick on the Daywear makeup is close to my perfect color. Kira has more of that sheen, a beauty mark and the iridescent eyeshadow on the Runway skin. All of the Marzipan lips remind me of chocolate, except for the Glam skin which has that impossible rich red rose petal gradient. Seren has more gorgeous porcelain skin and more makeups I don’t care for. Forgive the odd look of my hair and eyebrows but I wanted to keep everything the same for comparison’s sake. Some of the rest of them have realistic looks but Cocoa is where it really hits for me. The way the lip color shines is exactly like every African American woman I’ve ever known. So, if I like so many of them, why am I wearing all demos? Because they’re all too dark! Most of the list I wore Stratus but I’m a Nimbus girl. Only one face came out in that, see below. Vanity is the only Ton Visage face that came out in my preferred tone of Nimbus. However, it was pretty ghastly. The highlights look like I didn’t know where to stop with the glitter dust. The Stratus version of the same skin looks better though, which may be why no other Nimbus skins have come out. The announcement says this is the new direction of Sin Skins. While the facial shading on the darker skins is fantastic, the lack of full skin range we’re used to is troubling. Does Portia mean to focus on making incredible makeups for two skin tones at a time? Or will she flesh them out eventually? Is she buried in photoshop as we speak? Or has real life conquered all? I’ve heard stuff secondhand but first hand communication is needed here. Thanks to Second Wave for the O Ring bikinis. In the huge gown release Ginny did a short while back I ended up with this one. I don’t think I had many formal gowns in red. Why do I need so many formals I have no clue. I just love them. New skins with the opening of the Sin Skins sims. This is the Valentine Kitten skin that was just released. This hair is one I had picked up at Calico Creations. Okay, so I’ve raided my inventory and came up with this hodgepodge of newer and older stuff. Some of the stuff is no longer being sold. Tried a hair designer I hadn’t bought from before. I don’t think I like her texture either. 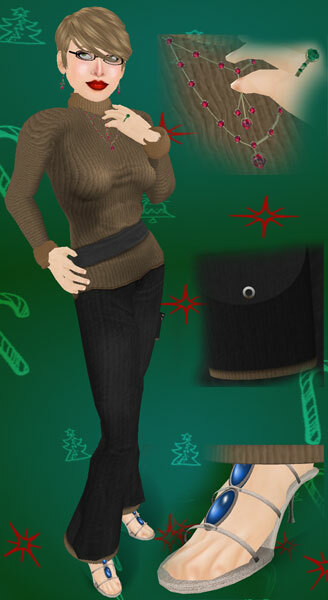 You are currently browsing the Portia Sin – Sin Skins category at SL Fashion Notes.